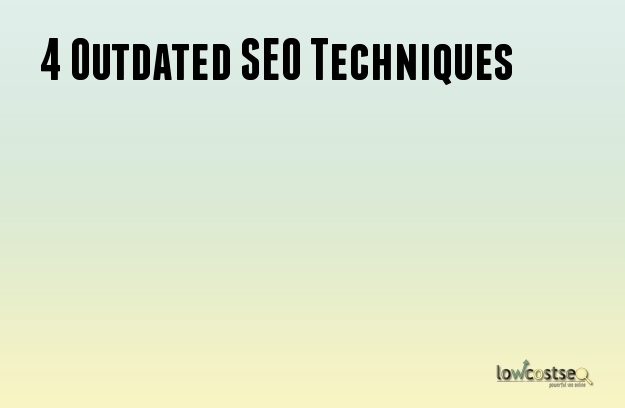 What are the 4 Outdated SEO Techniques? Exchanging links with websites similar to yours used to be an easy and effective way to quickly improve your search engine ranking. It was common for websites to have a “related links” section or a “blog roll” or links. However, in the past few years, this technique has been made completely useless. Search engines caught on to the whole link exchange thing, and since exchanging links doesn’t make a website more valuable to searchers, search engines ensured that exchanging links will not help websites climb the search engine rankings. Submitting articles with links to your websites to submission websites such as EzineArticles used to be a sure-fire way to get quality links. You got the link from the article submission website plus whenever someone used your article on their website, they were forced to link to your website. Unfortunately, Google and other search engines have put a stop to article submission websites. The link they provide is almost useless from a SEO perspective. In addition, other websites that use your article are usually spammy. As a result, submitting articles to article directories can actually harm your website’s ranking. It used to be relatively easy to achieve a good ranking in search engines. One only needed to stuff a page full of the required keywords and link out to tons of websites using the keyword in the anchor text. While it’s still important to use the keyword sparingly in the text of articles, keyword stuffing will guarantee only one thing: your page will be penalized in search engines. Keyword stuffing is completely outdated and will not help your SEO goals at all. Directories used to be an easy way to get quality links to your website. Alas, directories are nearly useless now. There are a few good ones worth submitting to, but other than those, they have been downgraded by Google and other search engines. Avoid wasting time using these outdated SEO techniques and focus on SEO that works. Before long, your website’s ranking will greatly improve. At Low Cost SEO, we only use modern SEO techniques that work. When you use our services, your website will quickly gain high rankings in the search engines. All in all, its rather difficult to firmly say what works and what doesn't because many SEO companies out there use these old strategies and still are able to get some degree to success. We are not telling our readers to stop using the above methods but we are suggesting to limit your strategy into using such methods or relying on them. Search engine optimization should be about getting the right balance in the marketing strategy from day one and focus on various methodologies too. We believe little knowledge in Search engine marketing is dangerous because one does not fully understand what he/she is doing correctly. Its always best to take consultation or advice from the people who are best and experienced in this industry. Good Luck with your Strategies!